Hamadryas baboons are old world monkeys found on both sides of the Red Sea, i.e., in the Horn of Africa as well as in the Arabian Peninsula. 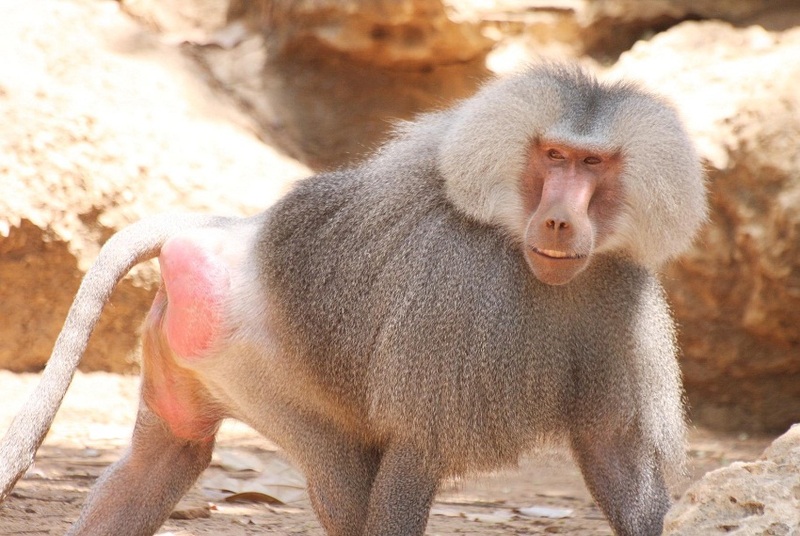 Size: These baboons are around 2-2.5 ft (61-76 cm) in length from head to the base of the tail. The tail itself can measure 1.25-2 ft (68-61 cm). Their limbs are long with short digits. Weight: Males weigh between 44 and 66 pounds (20-30 kg), while females are around 22-33 lb (10-15 kg). Color: The pelage of males is a silvery-white, and that of the females is brown. Their faces are pink or red. Males have a shoulder cape, which is absent in females and juveniles. Infants are much darker in color. Their fur lightens once they reach about one year of age. Sexual Dimorphism: Males are almost twice as large as females. Hamadryas baboons can be found in Somalia, Eritrea, Ethiopia, Saudi Arabia, and Yemen. They inhabit savannas, semi-deserts, and rocky regions. They also frequent agricultural lands in Ethiopia, thus being considered pests in that region. 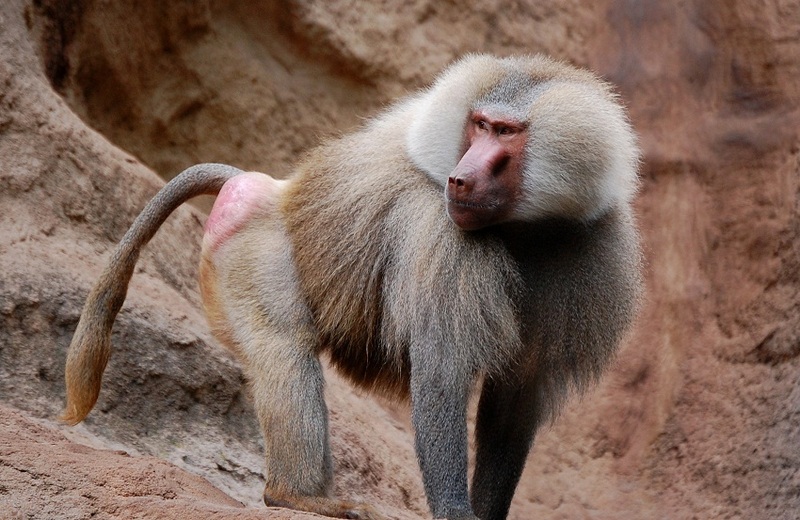 These baboons are mostly terrestrial, spending most of their time on the ground, but may sleep on trees or cliffs. They are a diurnal species, being active from sunrise to sunset. They are quadrupedal, i.e., walk on all four limbs. 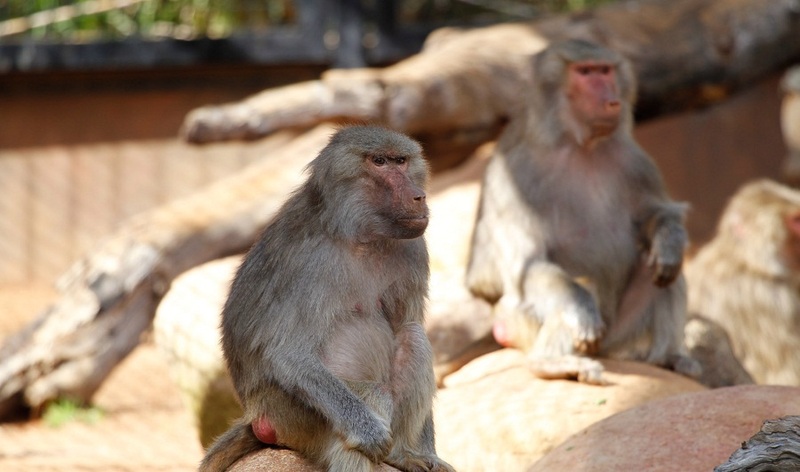 They are highly social primates, being well known for their characteristic complicated group structures. Each group is led by an adult male that controls a harem of up to nine females as well as their offspring. There is usually a subordinate male, called a ‘follower,’ which is related to the leader. The groups spend most of their time together. Several of these groups (one male unit) may come together to form clans. These clans, in turn, may merge with others to form a band. Males usually live in their native clan all their lives, but young females have been seen to be transferred between clans and bands. There may be disputes over food and sleeping areas between bands, which are usually settled with fights between the leading males of each band. Hamadryas baboons have omnivorous feeding habits. They are opportunistic feeders; likely to eat fruits, grass, roots, seeds, tubers, buds, leaves, and insects. They have also been known to hunt smaller animals like young gazelles and hares. 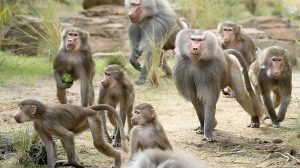 These baboons have adapted to survive on a minimalistic diet of just grass, an adaptation shared by all baboon species. They do not have a specific breeding season, but births tend to peak around May-July, as well as in November-December. The gestation period is around 172 days, ending with the birth of a single offspring. 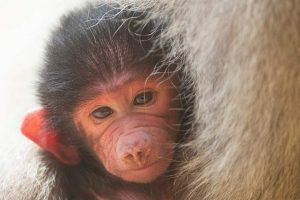 The infants are looked after by their mothers, on whom they are entirely dependent for the first few months of their lives. Females reach sexual maturity at around 51 months (4 years 3 months) of age, while males attain that stage when they are between 57 months (4 years 9 months) and 81 months (6 years 9 months) old. The lifespan of hamadryas baboons in the wild is around 20 years, but they live much longer lives in captivity; around 37 years. These animals communicate through visual, acoustic, and tactile channels. Adult males use a ‘wahoo’ bark to deter predators and signal to other males of their presence. 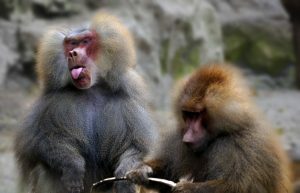 All hamadryas baboons use rhythmic grunts while approaching another of its kind, to convey friendly intentions. A shrill bark is used by all except adult males to express alarm. 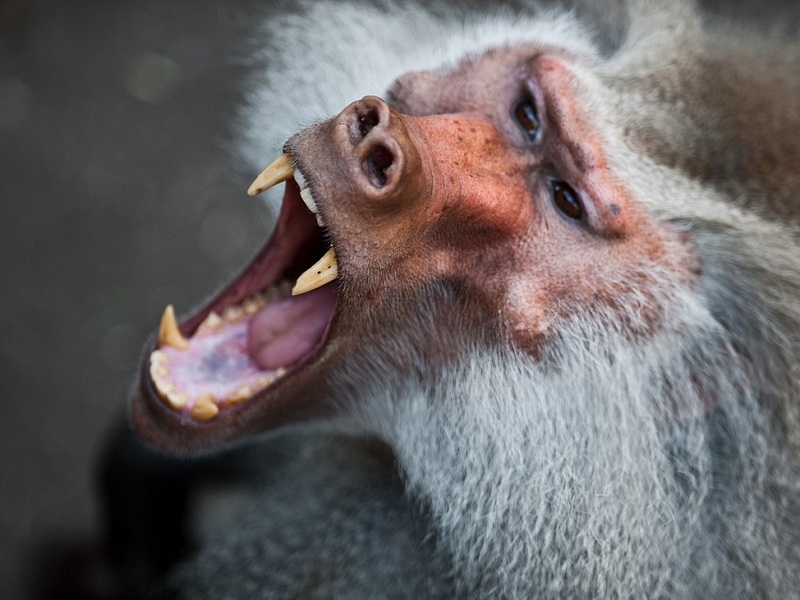 Fights between males are usually preceded by them yawning so that they can show off their teeth, a gesture of threat. 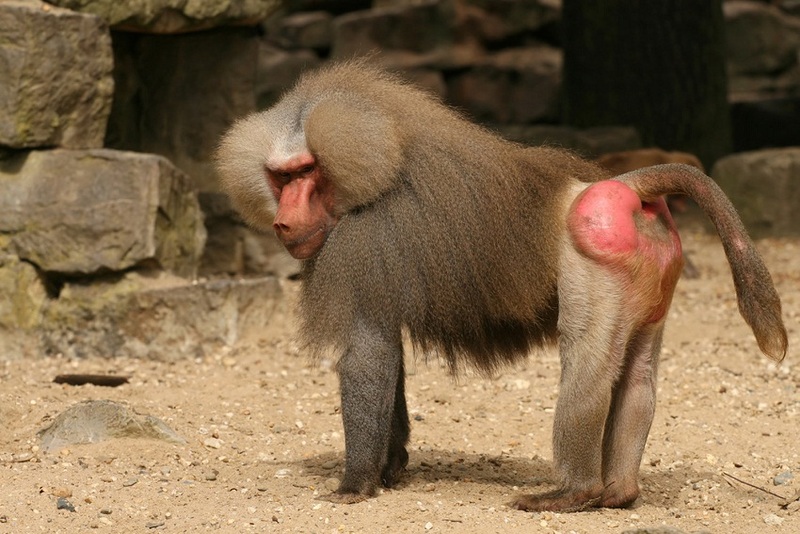 A common between all five baboon species, both genders have ischial callosities near the buttocks that provides a padding that ensures comfortable sitting. 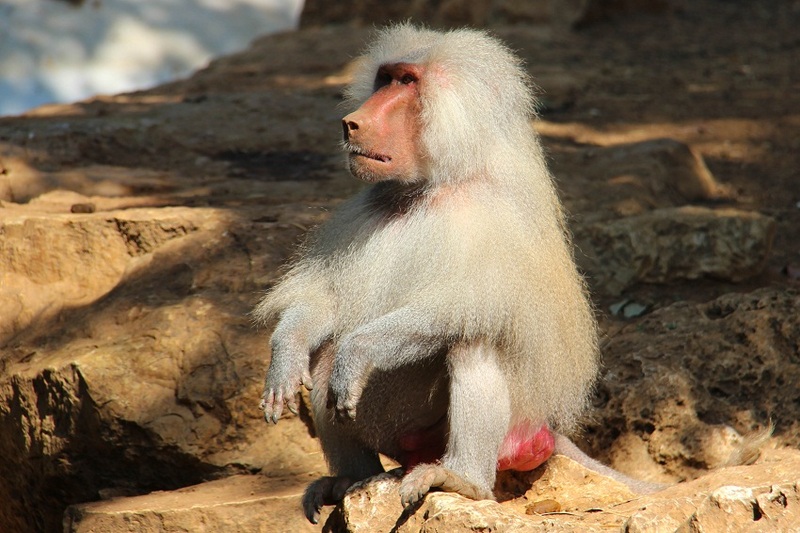 Hamadryas baboons do not have many natural predators in its range, being preyed upon only by leopards and hyenas. The IUCN lists these baboons under their ‘Least Concern’ category. The hamadryas baboon was considered sacred in ancient Egyptian religion, with some getting the honor of being mummified after death. It has the northernmost distribution among all the baboon species.